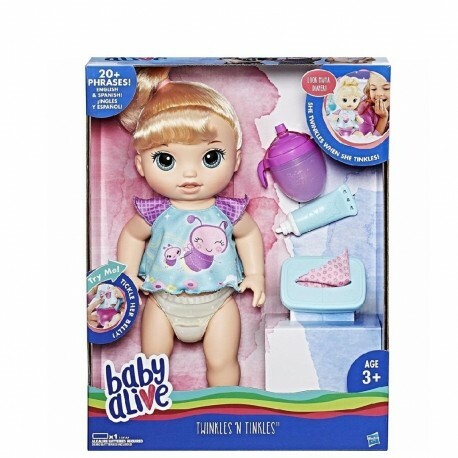 Mommy and daddy moments can feel so magical -- especially with the Twinkles 'N Tinkles doll! Her diaper lights up to let kids know she’s tinkled and needs her diaper changed. She makes real drinking sounds when kids pretend to feed her the included bottle. Was that a twinkle? Time for a diaper change! Open her diaper and wipe baby with the included wipe and wipes box. Don’t forget the diaper cream bottle! She thanks mommy or daddy after she’s all cleaned up -- she has over 20 phrases and sounds in both English or Spanish. See what she says when her belly is tickled! Her hair is rooted in style and play with, too. Kids can feel like real, responsible mommies or daddies pretending to feed, clean, and take care of a baby. Includes doll, outfit, bottle, diaper cream bottle, wipes box, 1 wipe, and instructions. • Powered by 1x 1.5 AA Duracell Alkaline Battery. Demo battery included.